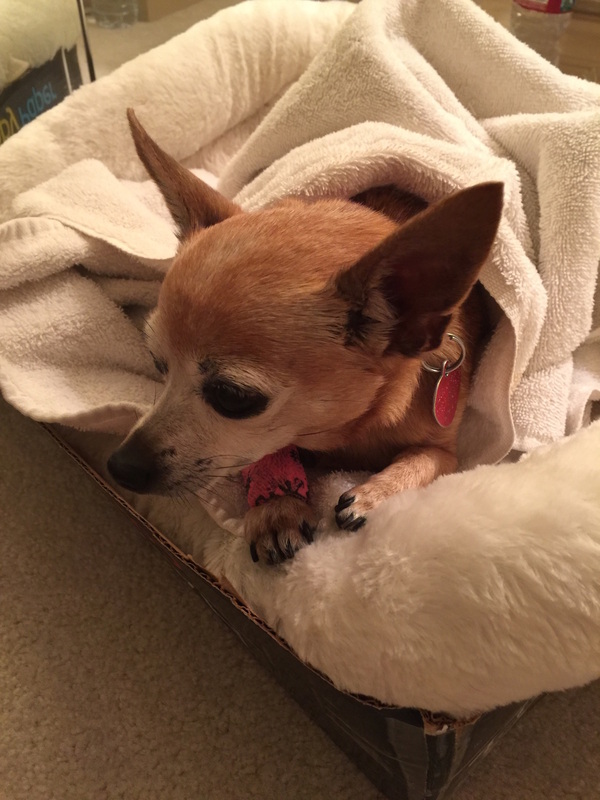 Tues. 11.29.16 – My mom was walking Canela, her chihuahua, down the street from her cousin Lynn’s house in Palm Desert this morning when a pit bull jumped out of an open window of a contractor’s truck and attacked Canela. My mom was not able to stop the dog from attacking Canela and the pit but ripped her open. Luckily the contractor heard my mom’s screams, ran out and laid his whole body on his dog to get it to stop. Canela was swiftly wrapped in a t-shirt with an ice pack and rushed off to an emergency vet, as intestines were coming out of a hole in her tummy, as well as bite marks on her back. She was out of surgery and ready to be taken home by 4:30pm. The vet is positive that she should recover. When I asked my mom about it on the phone this evening she was still in high emotion and so I did not have a clear understanding if the pit but just ripped open Canela’s abdomen or if the intestines were perforated as well. Hopefully, Canela will not have an intestinal infection and will recover. The whole thing is terribly upsetting. The dog owner at the time claimed he would pay the vet bill. Hopefully he will. Readers of this blog post: If you choose to own a power breed or a pit bull breed of dog, please for the sake of the rest of us – have your dog fully trained, walked/ran daily for more than 45 minutes, and if you can’t be next to your dog and your dog is in public – please please please have it restrained. I had a lovely little jerk of a 12 lb. Maltese dog for 12 1/2 years and I followed my above recommendations. If you have a dog and don’t have the time nor inclination to train, walk, and restrain your dog, please re-home it with someone who will. We all thank you – esp. small children and other small animals. by Ms. Jen on Tue November 29, 2016 | Permalink | news + events.